Nineteen families of Dutch and German descent organized themselves in 1892 to provide for the construction of their own little Church. Along the present Gooding Road lay four acres of land, owned by John VanDyke, and these four acres he gave for a building site. Then Ben VanDyke paid a personal visit to Bishop Richter and obtained permission to build a Church. In the late Spring of 1892, Oscar and Will DeVall of Conklin began, with the aid of the parishioners, to build the new Church. In the Summer of 1892 Paul VanDyke donated the wood which he had cut for building his house. When the zealous Father John B. Egge, pastor of St. Joseph, Wright, took charge of the new missing, he hurried the workers along so that the church was completed by November 1st. The cost was approximately $4,000. The nineteen families who made it possible were: Ben VanDyke, Paul VanDyke, Charles VanDyke, Nicholas Denhof, Jacob Denhof, Jacob Riplo, John Riplo, Anthony P. Raap, Anthony J. Raap, Charles Breuker, John Vanderlaan, Nick Vanderlaan, John Umlor, Jacob Finkler, Conrad Deboer, Joseph VanOeffelen, Derk Beerbon, Jacob Brown, and Aloys Wierenga. ​A new bell was ordered for the Church and arrived at the Conklin Depot. The ladies decorated a wagon and the bell was ceremoniously transported to the Church where it was blessed and placed in the new steeple. Then on Sunday, November 9th, 1892, Bishop Henry Richter traveled by horse and buggy to dedicate the new Church. On that occasion, 26 were confirmed and 13 received their First Holy Communion. The following day, Jake Denhof married Minnie Graftema in the new Church. Before 1892 the people from Chester would travel by horse and wagon to St. Joseph, Wright. From 1892 to 1912 Frs. John Egge and Godfrey Guthausen came every Sunday from Wright to provide Mass. It was a familiar sight to see the men harnessing up the horse for Father so he could rush back after Mass. From 1913 to 1918 two Franciscans, Frs. Sylvester Ahlaus and Louis Hammer made the trip from Grand Rapids. The mission was growing and in 1916 it became necessary to enlarge the Church. In 1918 the Chancellor of the Diocese came from Grand Rapids and continued to do so until 1926. They were Fathers A.M. Fitzpatrick and Robert Bogg. Then Father Charles Baker, who as a Chaplain at Villa Maria in Grand Rapids, continued to care for the mission from 1927 to 1933. He encouraged the men to bring their teams of horses and worked with them as they dug the basement of the Church, making social activities possible. In 1934 St. Francis became a mission of the newly established St. Catherine's Church in Ravenna. Father Louis Schrems provided Mass from 1934 to 1936. In June of 1936 Father Stanisluas Betka was assigned to succeed Father Schrems. He took care of St. Francis Mission from Ravenna until 1945 when he was appointed the first resident pastor of St. Francis when it became a parish. Immediately, plans for a rectory were drawn up and a most appropriate rectory for a small rural parish was built in 1946. In the meantime Fr. Betka lived about a mile west of the Church and daily Mass was offered. It was a great cause of rejoicing for the people of the parish to have daily Mass celebrated, despite the altar boys occasionally having to wear gloves due to the cold. In 1952 Father Louis Lapres became the pastor. Arrangements were made for the children of St. Francis to attend St. Catherine's school and the parish bought a bus to transport them. In the meantime, the parish festival and parish dinner were attracting people from a wide range and this helped to pay for the bus and the new rectory. Father Joseph Godzisz succeeded Fr. Lapres in April of 1953. Father Joe issued the first bulletin for the parish on March 21, 1954. He had the altars redecorated and purchased a new bus. Father Joe left St. Francis in 1958 and was succeeded by Fr. Theodore Sniegowski. Father Ted instituted the Confraternity of Christian Doctrine program in the parish when in 1959, a teacher shortage made it impossible to send the children to St. Catherine's in Ravenna. At that time our C.C.D. program involved four sisters of Notre Dame from the Basilica of St. Adalbert's parish in Grand Rapids, 20 lay teachers and 204 children. In October of 1959 permission was obtained from Bishop Babcock to add an addition to the front of the church, which included lavatories and a vestibule. At the same time the interior of the Church was redecorated, classrooms were added to the basement, the parking lot was paved, and new shrubs were added to the landscape. A new organ was purchased and a parish library was established. In 1963 new pews were added and the old pews were donated to the poor Indian Mission Church in Elbridge, Michigan. New carpeting was later added in the sanctuary and down the aisle to the front door. 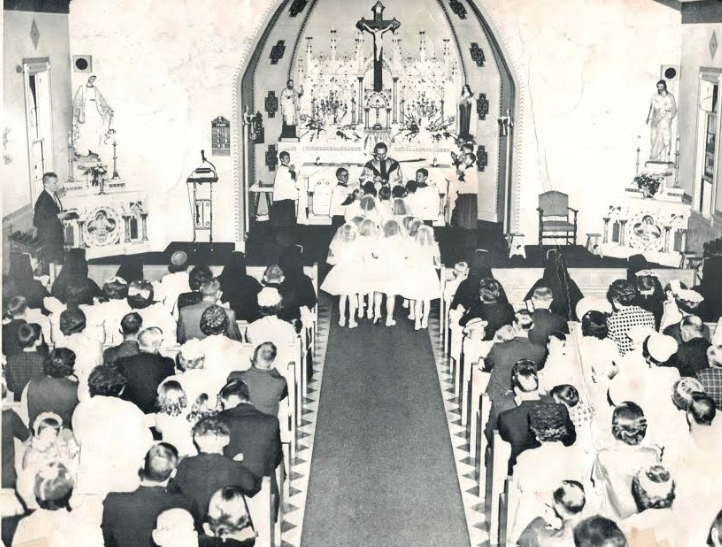 With the changes in the Sacred Liturgy in December of 1964, the altar was detached and brought forward and the parish embarked on a successful campaign of active participation in Sunday Mass. Father Ted was just completing a second garage, linking the rectory to the church when he was succeeded by Fr. Joseph McKinney in 1965. During the summer of that year the renovation of the basement was completed to better serve the C.C.D. program and the parish purchased a car for the sisters who came from Grand Rapids each week. In 1966 the side altars were remodeled into shrines and a new ventilation system was installed. Later the communion rail was removed. The cemetery was enlarged due to donate land from Tom VanDyke. In 1967 the Shrine of the Resurrection was installed in the cemetery to mark the 75th anniversary of St. Francis Xavier Parish. Fr. McKinney was ordained a Bishop in 1968. Father James Fellows succeeded as pastor and also worked in the Diocesam Chancery. A much larger organ was purchased during his pastorate. In 1972 Father Joseph Zaskowski was named pastor. He worked zealously to improve the religious education program. In 1977 he died suddenly and unexpectedly. Three funeral Masses were celebrated at the church in order to accommodate all of the priests, friends and family. Fr. Michael McKenna succeeded as administrator while also serving as the secretary for the Bishop. In 1978 Fr. Charles Dautremont was named pastor while also serving in the Diocesan Chancery. Under his pastorate the bell tower was constructed as a memorial in honor of the deceased Fr. Zaskowski. In 1981 Fr. Max Ostrowski was designated at the successor of Fr. Dautremont. In 1982 the interior was completely redecorated and completely carpeted. In 1984 a barrier free entrance was added and then a new organ purchased in 1989. As of now, St. Francis Xavier is clustered with St. Catherine's and St. Joseph Parish and is served by Fr. Fred Brucker.